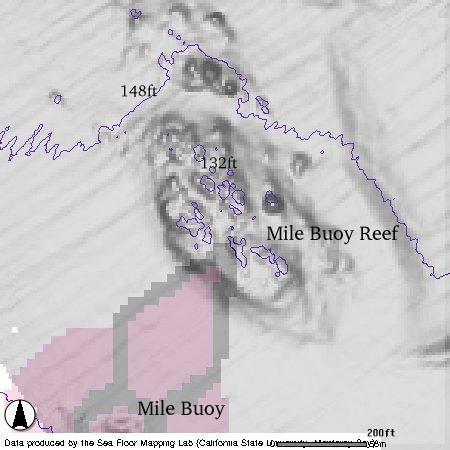 Access Information: This is the rocky reef area just north of the Mile Buoy. Very similar to Hopkin's Deep Reef. Large rocks on a sandy bottom with maybe 10-15 feet of relief. The rocks have large numbers of Metridiums, Cup Corals, Gorgonians and Elephant Ear sponges. There is very little Corynactis and thus it isn't as colorful as some spots in Carmel but it is still quite scenic. Sandy areas have large numbers of Sea Pens.